Perfectly Designed for FTTx Last Mile Applications The Data Connect 5224V-DSGSFP series is telecom-level high performance VDSL2 IP DSLAM (Digital Subscriber Line Access Multiplexer) with 24-Port VDSL2, 2-Port Gigabit TP / SFP combo interfaces, Hot-Swappable AC/DC Redundant Power System and robust Layer 2+ switching features. The DCE 5224V-DSGSFP series is fully compliant with ITU-T G.993.2 standard and supports VDSL2 30a profiles to offer maximum download and upload line rate up to 100/100Mbps on the existing pair lines. The DCE 5224V-DSGSFP helps service providers to easily provide high bandwidth demanded triple play service such as IPTV, HDTV, Video Phone and Internet Gaming at the same copper line and uplink to core / metro Ethernet network through the two Gigabit fiber optical interfaces. It is an ideal CO solution for FTTx Last Mile applications of broadband access by ISPs, Telecom and campuses. Comprehensive and Advanced VDSL2 Configuration For bandwidth and distance of broadband access, the DCE 5224V-DSGSFP VDSL2 IP DSLAM supports multiple selective VDSL2 profiles (8a, 8b, 8c, 8d, 12a, 12b, 17a and 30a) and 997/998 Band plan to each subscriber line. To help the ISPs provide always on internet access service in different physical line installation environments, the DCE 5224V-DSGSFP supports configurable DPBO (Downstream Power Back-Off) and UPBO (Upstream Power Back-Off) to adjust the downstream / upstream transmit power levels for service provider to reduce the interference by nearby wires. Furthermore, it can be configured on a per-link basis for transmission mode, rate limitation and SNR (Signal-to-noise) margin. These advanced VDSL2 functionalities help service providers to adjust the line performance to ensure the VDSL2 service not be impacted by other xDSL services n the same binder group and building a stable and reliable IP DSLAM solution. The Data Connect 5224V-DSGSFP series gives the excellent bandwidth to satisfy play devices for home entertainment and communication. 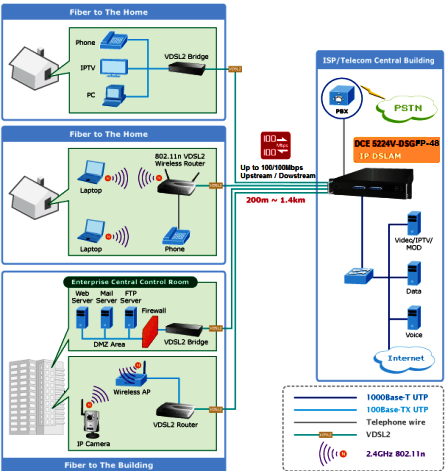 Traffic Flow QoS Ensuring for Application Service The VDSL2 DSLAM contains robust QoS features such as Port-Based, 802.1p priority also IP TOS/DSCP. It guarantees the best performance at VoIP and Video stream transmission and empowers the enterprise to take full advantages of the limited network resources. Efficient Management Afford the current network to grow and expand, the Data Connect 5224V-DSGSFP series provides console and telnet command line interface, advanced WEB and SNMP management interface to fill this kind of demand. With its built-in Web-based management interface, the VDSL2 DSLAM offers an easy-to-use, platform-independent management and configuration facility. The VDSL2 DSLAM supports standard Simple Network Management Protocol (SNMP) and can be monitored via any standard-based management software. For text-based management, the VDSL2 DSLAM can also be accessed via Telnet and the console port. Moreover, the DCE 5224V-DSGSFP series offers secure remote management by supporting Secure Socket Layer (SSL) connection which encrypts the packet content at each session. The features above provide an efficient way for the administrators to manage the device from the Internet environment with no need to add extra secure system either by means of hardware or software. Robust Layer 2 Features For efficient management, via WEB interface the DCE 5224V-DSGSFP series can be programmed for basic switch management functions such as port speed configuration, Port link aggregation, IEEE 802.1Q VLAN and Q-in-Q VLAN, Port Mirroring, Rapid Spanning Tree and ACL security. Additionally, the firmware includes advanced features such as IGMP snooping, QoS (Quality of Service), broadcast storm and bandwidth control to enhance bandwidth utilization. Advanced Security The Data Connect 5224V-DSGSFP series offers comprehensive Layer 2, Layer 3 and Layer 4 Access Control List (ACL) to filter out unwanted traffic. It protection mechanism comprises of RADIUS and Port-Base 802.1x user and device authentication. Moreover, the VDSL2 DSLAM provides MAC filter, Static MAC, IP/MAC binding and Port Security for enforcing security policies to the edge. The administrators can now construct highly secured corporate networks with considerably less time and effort than before. Extremely Reliable Design to Ensure Continuous Operation Power Redundant The Data Connect 5224V-DSGSFP series supports the optional hot-swappable Redundant Power System (RPS) to ensure continuous operation. The Data Connect 5224V-DSGSFP series equips with one 100~240V AC Power supply unit and the DCE 5224V-DSGSFP series equips with one DC -48V power supply unit on their standard package. To enhance the reliability, the 5224V-DSGSFP series provides one spare power supply unit in slot for optional 100~240V AC or DC -48V redundant power supply installation. The continuous power systems are specifically designed to handle high tech facilities requiring the highest power integrity available. Also, the -48V DC power supply implemented makes the DCE 5224V-DSGSFP series VDSL2 DSLAM as a telecom level device that can be located at the electronic room. The Data Connect 5224V-DSGSFP series is equipped with temperature sensor and cooling fans to ensure reliable operation. Whenever there is abnormal temperature detected or cooling fan service stops, the managed VDSL2 DSALM would display related information on the Web management interface. 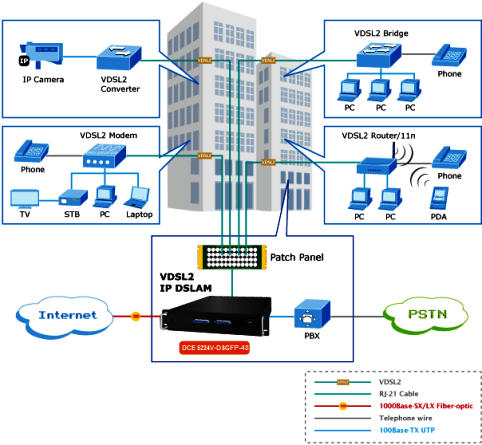 Therefore, it helps the administrator to efficiently manage the managed VDSL2 DSLAM operation. Perfect solution for Network Service Provider to offer broadband services Co-work with various The Data Connect 5224V-DSGSFP VDSL2 CPE product line, the DCE 5224V-DSGSFP series provides up to 100/100Mbps symmetric data rate within 300m and in long range connections. It offers the benefit of high performance to central office co-location and MTU (Multi-Tenant Unit) / MDU (Multi-Swelling Unit) markets. It provides service of broadband data over existing copper wires without affecting the conventional voice service by 24 subscriber ports with built-in POTS splitter and long distance support through the two fiber optic uplink interfaces. The various distances of SFP (small-form factor) and Bidi (WDM) transceivers are optional for customers. The DCE 5224V-DSGSFP VDSL2 IP DSLAM is a great and ideal solution for FTTx (Fiber to the Building, Fiber to the Campus of Fiber to the Home) application. It supports high bandwidth VDSL2 over existing telephone wires in the “last mile” from the ISP / Telecom / Service provider’s fiber node to the buildings and customers’ home with cost-effective and high value central management capability. IPTV, VOD and digital message broadcasting services are the worldwide hot trends, and more and more service providers have gradually upgraded the client side devices from analog system to digital system. The Data Connect 5224V-DSGSFP series VDSL2 CO Switch and DCE 520XXV series VDSL2 CPEs are the best solution to quickly provide cost-effective and high speed network services by utilizing the existing telephone wire infrastructure. IP network installation s straightforward and requires no extra wiring. With enough bandwidth, the 100/100Mbps symmetric capability of DCE 5224V-DSGSFP series enables many Multi-Media services on local Internet to come true, such as VOD (Video on Demand), Voice over IP, Video phone, IPTV, distance education, and so on. The DCE 5224V-DSGSFP series provides excellent bandwidth to satisfy the triple play devices for entertainment and communication. Meanwhile, this kind of infrastructure will minimize the burden on the Internet.